Previous reports from Silver Star are in the November Journal. More of the same spectacular stuff today. More great skiing, but I'm short on time and really have nothing else to say today. I guess the great training here is leaving me speechless. I'll do better tomorrow. I promise. Rumors are starting to circulate that the races in Kimberly next week will be moved here to Silver Star. This news has all the people who have left Silver Star up in arms. If only they had stayed , they would have had great skiing and would have been ready for the races. But instead they went home (where in most cases there is no snow) and made plans for Kimberly. Now I wish I could say that I am stylin' because I decided to stay, but due to a number of logistical factors, I think I will still end up flying to Salt Lake on Sunday, then flying up to Calgary on Thursday and driving 6 hours back here. Such is the crazy life of a ski racer. It isn't that big a deal, because it is essentially what I would have done to go to Kimberly, except for the fact that I am already where I want to be. Nothing like traveling thousands of miles in order to end up back in the same place. This morning I did a few intervals to workout my frustration over the schedule change. I did 16x 45 seconds, skating. I was a bit tired starting out, but I felt better, both physically and mentally, as the workout went on. By the end I was skiing strong and thinking, "Well, on the bright side, I get to come back to Silver Star!" In the afternoon, I went for a short run and then did circuits at the weight room at the "National Altitude Training Center" here on the mountain. It was a good break from skiing. I think it is important to maintain your general strength during the season. You don't always get enough strength work in distance skiing, but you will need it when you race. I live for workouts like this morning. It was probably one of the best skis I have been on in the past few years. All week I have been listening to Silver Star "veterans" talk about how great the skiing is when you can ski around the alpine hill to Sovereign Lakes and then continue all the way around the mountain back to Silver Star. A couple times during the week I have checked the trail to Sovereign, but it hasn't been groomed. But today when I woke up I just knew it would be ready to go. We have received almost a foot of snow in the past 24 hours, it was cold last night, and not a cloud in the sky today. Perfect conditions to groom out some new terrain. So When I hit the trail at 9 this morning, I went straight to the Gold Mountain trail to Sovereign. To my delight, it was freshly groomed and no one had touched it yet. I took off down the trail, excited to be exploring new territory. The trail was perfect and I had it all to myself. I made it to Sovereign in about 25 minutes. Sovereign isn't open yet, but the Silver Star snowcat had gone through anyway. But as I entered the Sovereign trails, the groomed trail ended. The snowcat had kept going, but it had lifted up the groomer so the trail was choppy and narrow. It was just my luck that when I came to this point in the trail, a snowmobile with a small roller on the back went by and packed out a trail just wide enough for me to classic ski on. I decided to keep going, since I was just dying to do the full loop. After I got about one K down the trail, the grooming picked up again and the trail was impeccable. A bit strange, but I was thrilled to have a perfect trail all to myself again. I soon figured out why I was the only one on the trail. I had caught up to the groomer. He must have started out on the trail only a short while before I did. I circled back and took some pictures to give the groomer a little more time. Then I continued on. When I came back on to the Silver Star trails, I skied up to the top of the Alpine mountain and surveyed the spectacular view. I had only planned on skiing for two hours and at this point I was about 1:45 into my ski. But I just couldn't tear myself away from the trails just yet. I headed down a really fun rollercoaster trail called Aberdeen back to Sovereign Lakes before returning on Gold Mountain trail. When I got back into Silver Star I still had to ski up to our condo by going up an alpine slope. I could have taken the lift, but I was still so energized from my ski that I decided to ski up - and race the chair. I didn't beat the chairlift, but I did arrive at the top at the same time as a few snowboarders who had boarded the chair as I was starting out. Call it a draw. And the end of a fantastic workout. I went out skiing again this evening, after the sun went down. I have been doing a good amount of skiing here in the dark. I usually have my headlamp on, but I haven't really used it all that much. The snow is so bright that you can usually make out the trail ahead of you. Plus, there is nothing like the exhilaration of blasting down a hill without any clue what lies 20 feet in front of you. As fun as this is, I only recommend it on trails you are familiar with. Because of the new-fallen snow, the entire trail network is now open and so tonight I tried a couple of trails I had not skied yet. About 2Ks into my first unknown trail, I ended up in the woods on one of the turns. The groomer had been wide going into the curve and had backed up to make the turn. I didn't have the luxury of just throwing the engine into reverse, so instead I aimed for a gap in the trees and took my crash like a man, albeit a slightly embarrassed and shaken man. I turned on the headlamp after that until I was back on familiar territory. They do have one loop of about 4Ks that has lights on it, but I usually just avoid that because it gets pretty crowded in the late afternoon and early evening. Intervals today. I won't be racing this weekend, so the coach and I thought it would be good to pick up the pace a little today and do a few short, but very hard, intervals. In my one ski over to Sovereign Lakes yesterday, I fell in love with that trail, so I headed in that direction today. I was a little disappointed to see that someone had beaten me to the trail today and I was only the second person on the new tracks. Life is tough. Today I was skating and the tracks were a little soft, since they have only been groomed twice. My skis bogged down every once in a while, but for the most part, it was another great day on the tracks. When I arrived at Sovereign, I was shocked to find at least 100 cars in the parking lot. I guess they are open now! I used the well-packed trails at Sovereign to start my intervals. I did one six minute interval at level II-III, and then did 4x 3 minutes VERY hard. Collapse-on-your-poles-at-the-end-of-each-interval hard. The trails were packed with hundreds of skiers, families with young children mostly, and I took great pleasure in picking my way through the crowds at top speed. Near the end of one interval, I passed a skier shuffling along on touring equipment. After I stopped to recover, he caught up and said, "I need to get me some of those," pointing at my skis and boots. "It's a lot of fun," I replied. "Looks more efficient," he said and then skied away. A couple minutes later I started my next interval and quickly blew by the helpless tourer. I heard him yell, "Showoff!" as I went by, but I wasn't about to slow down to apologize. The intervals went well and finished up my ski by returning to Silver Star around the backside of the mountain. I was pretty sore after doing strength the other day, so I decided that I need to do more of this. So this afternoon I went back to the weight room. I used the rollerboard, bench, squat machine, and stomach and back devices over the course of my 30 minutes in the weight room. The past few nights, we have been watching the Christmas specials on CBS. This, along with those catchy Gap ads, has really been getting us in the Christmas spirit. So tonight, Chris went down into the village to get egg nog while I went out and chopped down a Christmas Tree with a kitchen knife. We had ourselves a nice little Christmas party. 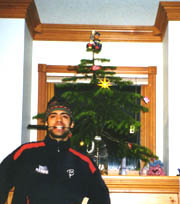 We decorated the tree with assorted ski paraphernalia such as ski ties, zipper thermometers, stickers, etc. The crowning ornament on top of the tree is absolutely hilarious, but it will remain an inside joke. We had planned to go sledding to cap off the evening, but due to lack of motivation by some and lack of packing time by others (me), it never happened. But at least now it really feels like the holidays. It was an early morning for me today. My shuttle to the airport left at 11:15 so I had to get up at 6:30 (early by my standards) in order to ski for a couple of hours before leaving. It was a great morning for skiing and I finished off my trip by skiing my new favorite - the around-the-mountain loop. I would be very sad about leaving this place, but I can take solace in the fact that I will be back here in four days! It is now 99% likely that the races next weekend will be moved from Kimberly to Silver Star. So why am I going all the way back to Utah? Good question. For one - my bank account just bottomed out, so I have to go back and look under the sofa pillows for money to deposit. Since I have already paid for my round trip ticket to Calgary on Thursday, this gives me the chance to get off the mountain for a little break. Plus, if I stay I will have to return to Silver Star after the races in Canmore in two weeks, rather than just flying right home from Calgary. Time is of the essence there because I return to Utah on December 20 and I leave to go home for Christmas on the 22nd. Ahh, the jet-setting life of a ski racer. From November 1 until the end of the year, I will have paid $660 in rent and spent a grand total of 12 nights in my own bed. For $55 a night, you'd think I'd live in a much nicer place. Rumor has it that they have received some snow in Utah and there is skiing. Supposedly, the snowmaking on the new Olympic trails has begun and they should be skiable within days. I'll give a full report when I get home, since my house is about a mile from the trails. That's it for my daily reports from Silver Star, but get psyched for my reports from, uuhhh, Silver Star, starting on Thursday. In order to make snow, the pump house has to be kept above freezing and there isn't even a roof on it yet. And I also heard that, according to the snowmaking system manufacturer, it will take 6 weeks to make enough snow on the entire course. Neither of these reports have been confirmed, so I am just spreading more rumors, but what I know for sure is that the rumors about skiing here this week are false. Scott, Erik and I did manage to ski today though. On the outskirts of Salt Lake City is a canyon called Mill Creek which gets groomed for x-c once a week. That place holds snow like a freezer. It is only an out anc back, or more appropriately, up and down, trail but it was very good skiing today. 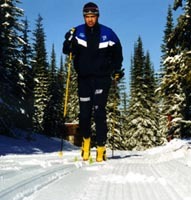 We all used our good classic skis to do some intervals. It is amazing that the skiing in Mill Creek can be so good, but there is no skiing anywhere else. Well, I have been home for a whole four days, so it must be time to leave town again. And sure enough, I repacked all my bags this morning and jumped on a flight to Calgary. As of today, White Pine Touring is grooming trails on the golf course in Park City, but comparing Silver Star to that is like comparing a spectacular mountain run with going around a track about 100 times. Technically, it's the same sport, but just barely. So it wasn't too tough to say good bye to Park City and head back to my new second home in Silver Star. Scott and I were on the same flight to Calgary and when we arrived there we met up with Dave Chamberlain, Nathan Schultz and Erik Stange for a 6 hour drive over to Silver Star. We did about three hours of the drive before stopping for the night at a cheap hotel, where we piled five people into one room. The floor was surprisingly comfortable after a day of traveling.